Throughout the last 20 millennia tropical Africa has been affected by climatic oscillations of humid and abrupt hyper-arid events (Bastian et al. 2018; Collins et al. 2011, 2017; Gasse 2000) that caused drastic transformations in landscapes, in hydrological catchments and in environmental patterns. These abrupt climatic oscillations, which are driven by the variability of the Ethiopian African Monsoon both provided favourable ecosystems that may have facilitated societal development, but also produced arid environments that may have restricted human exploitation of the landscape. Recent archaeological data from the Horn of Africa has demonstrated regional and chronological irregularities in the introduction of agro-pastoral practices. A time-lag exists between the earliest livestock events in east Africa and those in Arabia and the Middle East. As a result of ecosystem variability and sensibility, environmental dynamics in the Rift and Afar regions may present an advantageous perspective to understanding the complex passage from a dominantly hunter-gathering way of life (20 000-5 000 BP; Bon et al. 2014; Kusimba 1999; Ménard & Bon 2015) to a Neolithic one (5000-2000 yr BP; Gutherz 2013). My Phd dissertation “Understanding human-climate coevolution: The role of climate change on the LSA-Neolithic transition in the Horn of Africa” (Université Cote d’Azur-IDEX doctoral grant) aims to disentangle existing data on the evolution of lakes in the Afar and Rift regions (Gasse 1975) and correlate it with new paleoclimatic, geomorphological and archaeological data in order to better understand the relationship between humans and climate change in the Afar, one of the most arid regions in the world. This research which is supported in part by a 2018 fieldwork grant awarded by the CFEE draws on several fieldwork opportunities including the VAPOR-Afar (L. Khalidi dir. ; Ethiopia), PSPCA (J. Cauliez dir. ; Djibouti), TelluS-Rift (C. Doubre dir. 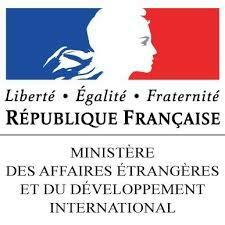 ; Ethiopia) interdisciplinary projects which are and have been financed by a host of institutions including the Fondation Fyssen, the ANR ‘Big Dry’, the French ministry of Europe and Foreign Affairs and the CNRS (INEE and INSU). More specifically, this Phd research aims to quantify the climatic rhythms, precipitation variations and their impact on landscape alteration using a multidisciplinary approach based on a) isotopic geochemistry applied to continuous sedimentary records of the Abhe lake basin (Afar Region, Ethiopia and Djibouti), b) geomorphology to understand landscape evolution in the Lower Awash (Afar region, Ethiopia) and Gobaad (Afar region, Djibouti) valleys, and c) soil micromorphology to investigate archaeological sequences in the Afar region (Ethiopia/Djibouti) in order to answer the following archaeological questions: What is the precise relationship between human occupation (presence and absence) and climatic oscillations during the LSA-Neolithic transition (20 000 to 4 000 yr BP)? What impact did the abrupt arid events (Heinrich I, 16 000 yr BP; Younger Dryas 13 000 yr BP) have on LSA groups? Were climatic oscillations inhibitors or catalysts for the introduction and agglomeration of Neolithic practices? Was there intensive exploitation of grassland by pastoral societies and did they have an impact on the development of hyper-arid conditions which began around 4 000 yr BP? Fig. 1: Lake Abhe (in the background) from the hydrothermal carbonate chimneys (Afar, Dibouti); © PSPCA. In 2018, I conducted geomorphological and archaeological fieldwork in the Abhe Lake basin in Djibouti and Ethiopia. From the 18th to 23rd of January I took part in the PSPCA project in the Gobaad Valley in Djibouti. Accompanied by geomorphologist L. Bruxelles (INRAP, IFAS), we conducted a geomorphological survey and soundings across the Gobaad landscape. From the 6th to the 28th of February I took part in the VAPOR-Afar project in the Lower Awash Valley in Ethiopia as part of a larger TelluS-Rift 2018-2019 transdisciplinary program that aimed to unite different academic fields and researchers by focusing on a holistic understanding of a single region of Ethiopia. Along with VAPOR-Afar field director L. Khalidi (CEPAM-CNRS) and geomorphologist M. Schuster (CNRS-EOST, University of Strasburg), we conducted geomorphological and archaeological surveys in the lower Awash plain (Ethiopia). This field experience was also animated by scientific exchange with three other research teams that were investigating the volcanological, seismological and medieval to modern history of this same region. This multidisciplinary collaboration permitted us to work towards a better understanding of the region (toponyms, geographic and geological details), providing new fieldwork perspectives and future collaborations. Geomorphological and archaeological fieldwork with both projects (VAPOR-Afar and PSPCA) was organised following three lines of research: a) the identification, description and sampling of lacustrine sediments belonging to the Abhe paleolake system. This approach allows us to begin refining existing knowledge on the variability of Quaternary deposits and to ameliorate identification and chronology of Abhe paleolake sediments in view of a future coring lake project. b) Sounding, identification, description and sampling of sedimentary environments associated with lacustrine transgression and regression phases of the Abhe paleolake. This category concerns all paleosols, aeolian palaeodunes, tephra levels, etc. ; c) Documentation and sampling of new archaeological sites linked to the sedimentary formation processes mentioned in points a) and b). Concerning the lacustrine deposits, we localised a great number of previously undocumented stromatolitic littoral formations associated with abrasion surfaces produced by wave action along the slopes of outcrops above the Abhe plain. These provide evidence of the precise altitude of palaeolake shorelines during one of the largest transgression of Abhe Lake and are proof of environmental stability during the humid periods associated with them. The samples collected will be dated by C14 to verify whether they coincide in time with other littoral data, and to clarify the precise time-lag between lacustrine transgressions. Other lacustrine formations were also documented and sampled including layers of shell deposits (bivalvia and gastropods), diatomite deposits as well as fluvial deposits for investigation on the fresh-water balance of the Abhe lake hydrological system. Fig. 2: Stromatolitic deposits on Kulsi Koma Hill and view on Borawli Mountain in the background (Afar, Ethiopia); © VAPOR-Afar. Turning to other sedimentary environments and to archaeological survey, the 2018 fieldwork provided an opportunity to work with specialists and to learn to recognise paleosol sequences and diagnostic archaeological assemblages unique to the region, which often contained LSA (Late Stone Age), ceramic Neolithic or more recent archaeological assemblages. 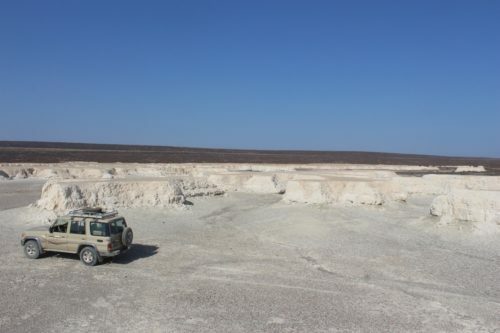 By identifying and following the stromatolite levels and reconstructing paleolake shorelines we were able to identify new preserved human occupation sequences along outcrops in the area. Soundings along sites produced sequences of paleosol formations often intercalated between aeolian sandy/silty levels implying alternation between arid and humid periods over potentially short periods. Micromorphological blocks were sampled in these soundings for estimate the pedological development, for clarify the relations between archaeological material and sedimentological formation processes, and for make the first paleosols typology of Central Afar. Dating of these paleosols is planned in order to directly correlate human occupation with the arid and humid sequences. Furthermore, the sedimentological and geochemical analysis of intercalated paleosols/paleodunes can contribute, along with lacustrine sediment analysis, to the investigation of paleoclimate change and paleomonsoon activity (Felix-Henningsen 2000). 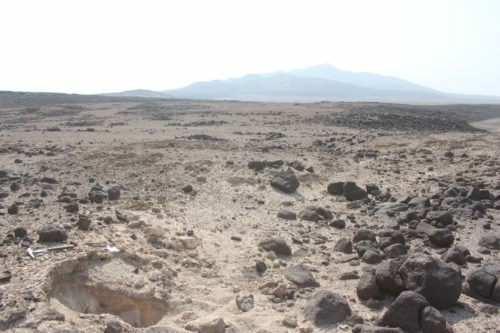 Finally, we localised and sampled pyroclastic and tephra layers within larger sedimentary sequences which will enable us to study the relationship between human occupation, paleolake dynamics and volcanic activity, and which we hope will contribute to the extremely important tephrachronology of the Afar region (Martin-Jones et al. 2017). 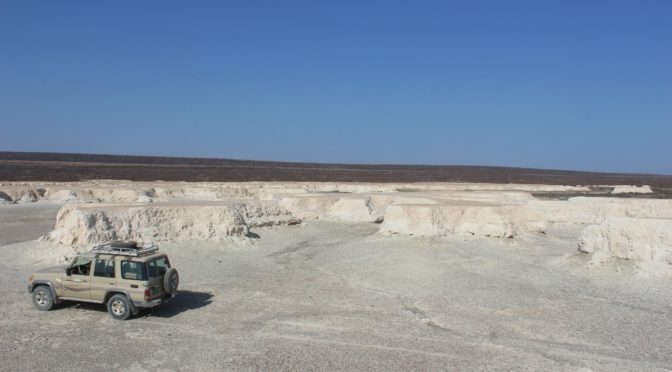 This first field experience in the Abhe palaeolake basin in Ethiopia and Djibouti was an incredible opportunity to familiarise myself with the evolution of this unique geological landscape, accompanied by specialists of the region, and to begin to collect primary data from its rich sedimentary and archaeological archives to conduct my doctoral research. Future geomorphological surveys in the Lower Awash and Gobaad valleys are planned in conjunction with a future lake coring project in the Abhe palaeolakes (Gamari, Afambo and Abhe). Laboratory analysis focusing on radiocarbon measurements of stromatolite carbonate samples and organic matter inside the paleosol sediments is now underway. The determined ages will offer a preliminary idea on the absolute age of geological and archaeological material. Subsequently I plan to begin micromorphological study of excavated deposits sampled and to put together a geochemical protocol for the investigation of these stromatolitic structures and soil sediments. This region has been little investigated from the perspective of human-environment relations across the Pleistocene-Holocene divide despite the incredibly rich sedimentary and archaeological archives. 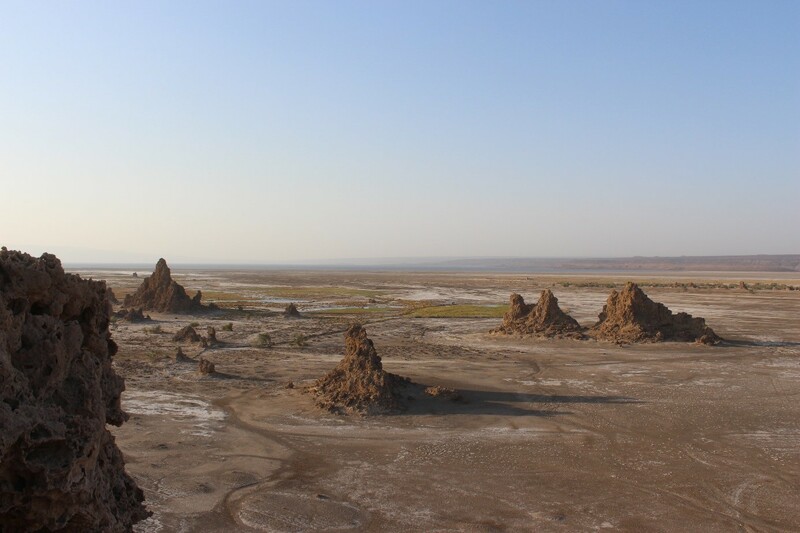 Analyses of the samples collected in early 2018 and future fieldwork in the area promises to contribute significantly to the reconstruction of past climate change and its effects on landscape evolution and human occupation in the Central Afar region. Fig. 3: Diatomite deposits in Gobaad valley (Afar, Dibouti); © PSPCA. Stromatolites are lacustrine layered accretionary fossil sediment built by the cyanobacteria activity. Stromatolitic sequences are formed in shallow-water of evaporitic lakes, therefore they represent the precise indicator of the paleo-shoreline relate with the lake high water-levels. (Krumbien 1983). This research would not have been possible had it not been for the investment and support of my thesis supervisors M. Revel and L. Khalidi, of my mentors L. Purdue and L. Bruxelles who have and will be guiding me through my reading of the landscape and its archives, and to the directors of the three fieldwork projects that have hosted me and will finance the fieldwork for the duration of my dissertation work, L. Khalidi (VAPOR-Afar), J. Cauliez (PSPCA) and C. Doubre (TelluS-Rift). The fieldwork would not have been possible without the collaboration of the Ethiopian ARCCH, the CFEE, the Afar Bureau of Culture & Tourism, the CERD and IRAH in Djibouti and our numerous funding agencies, nor would have it been possible without the support of my colleagues in the field, namely M. Schuster, E. Ficquet, R. Pik, N. Bellahsen, J.-B. De Chabalier, Y. Thouvenot, L. Coudert, M. Matu, A. Diaz, X. Gutherz, S.Hérouin, Aramis Houmed Soulé; the Ethiopian and local people who accompanied us during fieldwork: Natnael, Ahmed ; and the drivers of CFEE. This dissertation is funded by a UCA-IDEX grant and currently benefits from a CFEE fieldwork grant and funds for analyses from GEOAZUR and the CEPAM. last 5ky BP. A multi-scale and multi-proxy approach. Poster communication for the “4.2ka BP event: an international workshop”, Pisa, Italy (2018). Collins, J. A. et al. Interhemispheric symmetry of the tropical African rainbelt over the past 23,000 years. Nature Geoscience 4, 42–45 (2011). Collins, J. A. et al. Rapid termination of the African Humid Period triggered by northern high-latitude cooling. Nature Communications 8, (2017). Felix-Henningsen, P. Paleosols on Pleistocene dunes as indicators of paleo-monsoon events in the Sahara of East Niger. Catena 41, 43–60 (2000). Gasse, F. L’évolution des lacs de l’Afar Central (Ethiopie et T.F.A.I.) du Plio-Pléistocène à l’Actuel. Recostitution des paléomilieux lacustres à partir de l’étude des Diatomées. (Université de Paris VI, 1975). Gasse, F. Hydrological changes in the African tropics since the Last Glacial Maximum. Quaternary Science Reviews 19, 189–211 (2000). Gutherz, X. Quel Néolithique dans la Corne de l’Afrique ? Archéo-Nil 23, 73–90 (2013). Martin-Jones, C. M. et al. Glass compositions and tempo of post-17 ka eruptions from the Afar Triangle recorded in sediments from lakes Ashenge and Hayk, Ethiopia. Quaternary Geochronology 37, 15–31 (2017). Ménard, C. et al. Late Stone Age variability in the Main Ethiopian Rift: New data from the Bulbula River, Ziway–Shala basin. Quaternary International 343, 53–68 (2014). Krumbein, W. E. Stromatolites — the challenge of a term in space and time. Precambrian Research 20, 493–531 (1983). Kusimba, S. B. Hunter–gatherer land use patterns in Later Stone Age East Africa. Journal of Anthropological Archaeology 18, 165–200 (1999).